For Sale by Lori Deiter - 10.000" x 6.625"
For Sale framed print by Lori Deiter. Bring your print to life with hundreds of different frame and mat combinations. Our framed prints are assembled, packaged, and shipped by our expert framing staff and delivered "ready to hang" with pre-attached hanging wire, mounting hooks, and nails. CONGRATULATIONS on your tie for 2ND PLACE in our "WINTER in NEW YORK STATE" Contest! Lovely image! God bless. This house has a sense of sadness from the coldness and neglect. Great perspective. Great perspective and composition, Lori - voted! This is gorgeous. Love your composition, the reds on the white and including that fence really makes this pop! Beautifully done, with the feeling of windswept land and human abandonment. Nice compostion and very well done technically. Thank you for visiting! Lori is a photographer from central Pennsylvania. Country landscapes and wildlife are what Lori loves most. 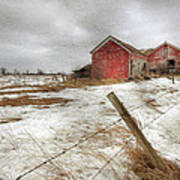 Lori uses Photoshop along with HDR, textures, and various treatments to present many of her images. 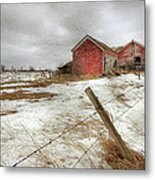 Lori uses her own original photographs in all of her images. Lori's work is also available to wholesale and retail customers at Penny Lane Publishing. No images may be copied, edited, or published without written permission from the artist.